The real way to learn the blues... by EAR!!! This eBook and mp3 track set contains 5 Blues Guitar solos, and complete tab and notation transcriptions of both the rhythm and lead parts. Each one is in the style of a specific artist: Albert King, Eric Clapton, Chuck Berry, Stevie Ray Vaughan and Jimi Hendrix. Any guitarist who wants to play the blues has to know the common licks (words) that are in the style (language). I have transcribed many solos by each of the artists listed, worked out their 'pet' licks and then combined them into one solo for you to learn. This the easiest way to learn the vocabulary of these blues masters. It will make you a better blues player if you follow my suggestions. See further notes below on how to make the most of this set. I have seen a huge improvement in all my private students using this material which is why I am offering it here. To use this product best it is YOU that transcribes the licks and then you just use the tab to check your work. Learning this way (by ear) is VERY important, and the way that every great blues guitarist learnt... only I make it easy by giving you the tab to check your work!! * NEW FEATURE * All 5 songs come with Guitar Pro files so you can play along, mute parts and explore the whole arrangement!! 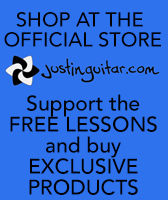 Special 20% discount for justinguitar students, click here!! Get a SAMPLE PAGE HERE so you can check it out but you'll need to install GP6 first! Click on the price below and you will be taken to paypal for payment of the product. Paypal is an internationally accepted means of payment, is very safe and secure and protects both buyer and seller. It accepts all regular card types (Visa, Mastercard, Amex, etc.) and you don't have to have a paypal account to use your credit card. In the many years I have been trading, I have never had a problem at all and have met only a few that have... and those few fell for phishing -read about it here - it's basically "internet common sense". 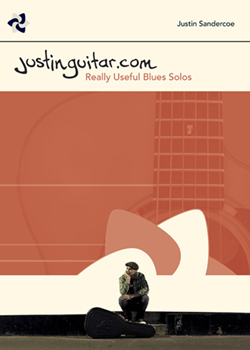 Really Useful Blues Solos is available to buy via digital download from Payloadz. It costs £15 and you can buy in any currency, paypal will make the currency conversion for you (currency conversion). The pack includes an A4 sized 30 page pdf eBook which contains guidelines on how to use the product and also the TABs for all the rhythm and lead guitar parts. Also included are 15 mp3 files. The A4 eBook prints great on US letter sized paper too (just make sure you have "fit to page" selected when you go to print it!). Clicking the link below will take you to paypal where you will pay for it, and then there will be a link to download the ebook from Downloadz. Of course, after downloading, you can print it as many times as you like. They will also send you a link to the file by email. It's really simple to do, safe and instant. Each track is is firstly played with all the parts. Then there is a minus rhythm part, then a minus lead part. Don't be fooled by the short track times - there is a LOT of information in these - these are pure solos, no words or singing... more than enough to keep most of my students busy for a month or two if you follow the right steps outlined below. mp3 sample of Chuck Berry solo - here. pdf sample of Chuck Berry tab sheet music - here. Get a Guitar Pro sample page here - but make sure you install Guitar Pro first! All content written and owned by Justin Sandercoe and ©2007. All instruments played and programmed by Justin. Real guitar, real amp, real bass, keyboard and drum sounds from Logic Audio. Recorded using Maton Messiah Acoustic, Fender Strat into Fender Prosonic Amp, Fender Jazz Bass direct into focusrite preamp. Effects added after recording using Logic Audio plug-ins and TC Electronic G-System.